Minecraft fans find an unexpected application of the usual, and sometimes even uninteresting, objects or functions of the game. For example, in Minecraft Java Edition the armor stand is used to create vehicles and interior items, and command blocks designed for fairly simple actions became the basis of mini-games and (together with Forge) killed the idea of creating Plugin API. And now, a fairly trivial feature in Minecraft Bedrock, which allows players to change the skin directly during the game, has led to very unexpected results. The matter is that changing the skin is accompanied by sending a new skin to the server, which already sends changes to all players. So, the creators of plug-ins can produce information about the change of skin at any time, simply by their own will. This allowed to create animated capes but it turned out that this is not the most amazing! One of the developers of MCPE servers showed a fairly simple but interesting idea. Is not it amazing? Do you know what is it? These are virtual players or NPCs, in which the skin and model are changed. The models that are presented above are generated based on the surrounding terrain. Thus, the model can be absolutely any. For example, in the form of a sphere. 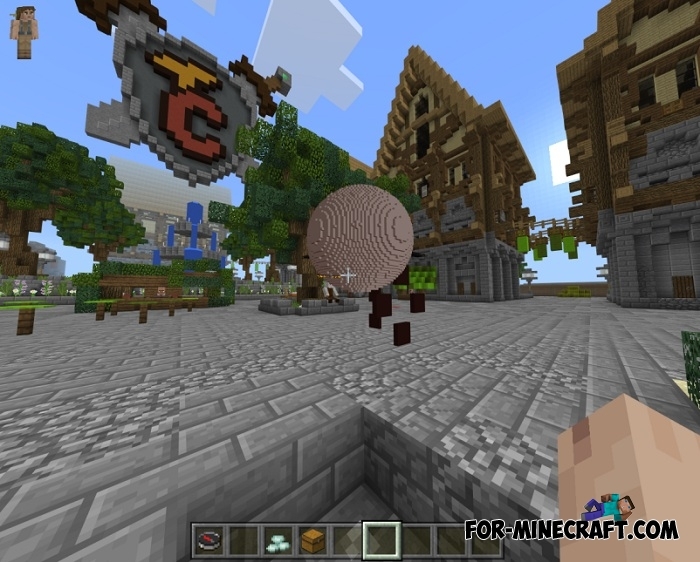 For creating such models, you do not need mods or resource packs, they are created by the server. So soon, going to the server you can meet something unexpected! And since such NPCs are not limited, everything is solely the fantasy of plug-in developers. Find your server for Minecraft Pocket Edition.